What is “success” on social media? Your social media marketing is successful when it consistently achieves real, measurable results for your business or organization. Success means you are effectively engaging your target audiences on all of the different social channels on which they are active. #DearKen: Help Me Understand How, When & Where To Use Hashtags! As mobile takes a center role in our lives —becoming the device we reach for to access information, conduct transactions and manage our homes, cars and daily routine — an increasing number of serious security concerns move to the forefront. 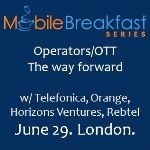 Ciaran Bradley examines this evolution and the impact on key members of the ecosystem, particularly mobile operators. #DearKen: How Do I “Pinterest-ize” My Marketing Content? At M-Pulse it's a month dedicated to mobile developer issues and we talk mobile app business basics opportunities with Ray Anderson, co-founder and CEO of Bango, a U.K.-based billing and analytics company that enables mobile developers to collect money for their apps. On the heels of SXSW it's clear that SoLoMo is a fact, not a fad. I catch up with BJ Emerson , VP of Technology at Tasti D-Lite, the frozen treat chain with a cult following among health-conscious consumers as well as celebrities. The company doesn't just get So Lo Mo -- it has literally written the book on it, and will be releasing The Tasti D-Lite Way :Social Media Lessons for Building Loyalty and a Brand Customers Crave a bit later this year -- so watch this space. BJ, a champion of SoLoMo and an authority on the ways companies can and should harness mobile and location to super-charge Social CRM, spoke at dozens of industry events in the last year, where he discussed the importance of moving beyond mobile integration of loyalty and rewards programs to really understanding the emotions consumers feel and want to express as they engage with brands on this deeply personal level. The approach certainly delivers results. This last year went on record as the "greatest growth" year in the history of the 24-year old brand. The brand —whose popularity has grown largely by word of mouth — is a veteran when it comes to customer engagement and social media marketing. Beyond U.S. growth, Tasti D-Lite is also expanding internationally, opening locations in Mexico, Australia and the United Arab Emirates.